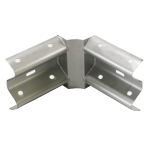 Armco Barrier Corners and changes of direction are easily managed with Cenpart’s Flexible Corners. 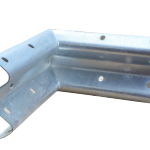 Available as Internal (corner inside a building) or External (corner outside a building), they are 90 degrees as standard but easily bent on site to suit any angle. 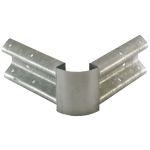 They are a major improvement in convenience and safety over the traditional mitred corner piece as they present a rounded corner rather than a sharp one. 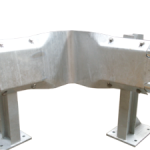 Mitred Armco Barrier Corners, fabricated to any angle. are still available if you need to match existing. 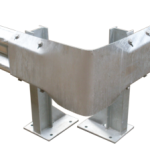 Similarly we can make short cranked sections that allow for the change from a straight and level run to the start of a ramp. 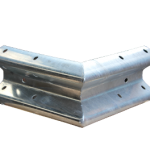 A continuous slope can be done with straight beams but if you to let us know the angle of your slope we will make a special to start the fall down.